Explore Las Vegas' best-kept secret, Red Rock Canyon, in a fun and unique way! This 3.5-hour guided scooter car tour will take you through this breathtaking national conservation area, which is a favorite among Vegas locals. At the visitor center, learn about local plants and wildlife before following your guide on the scenic 13-mile (21-km) loop. Admire the rugged scenery and enjoy free time for some light hiking on your own. Hotel pickup and drop-off, bottled water and entrance fees are included. Please note: price displayed is based per scooter; if traveling in a party of 2 please only select 1 traveler. If you wish to have individual scooters, select the number of scooters you will need. 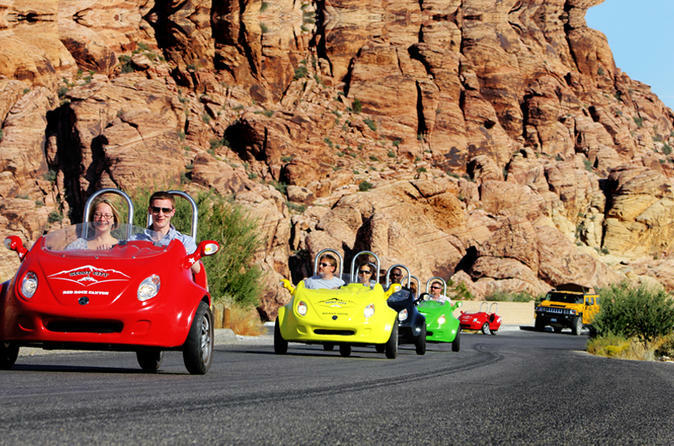 This fun, exciting scooter car tour will take you through Red Rock Canyon, a network of scenic canyons and surreal rock formations inside the Red Rock National Conservation Area. After hotel pickup in Las Vegas, your guide will drive you to the Summerlin area right near Red Rock, where you'll be assigned your scooter car, receive a safety overview, and take some practice runs. These easy-to-operate cars have no clutches or gears, and don't require a special license. Aboard your 2-person, 3-wheel scooter car, follow your guide approximately 5 miles (8 km) through the Mojave Desert on a paved road and arrive at Red Rock Canyon. Stop first at the visitor's center, where you'll learn about the park’s flora and fauna, wildlife and native Paiute Indians who once lived off this land. Next, your guide will lead the pack of scooter cars on the scenic 13-mile (21-km) loop through the canyon. Enjoy unobstructed 360-degree views of the landscape; see where professional rock climbers from all over the world come to climb; and keep your eyes out for wild burros, tortoises, jack rabbits and other wildlife. At designated stops along the way, you’ll have time to switch drivers and explore on your own. Your guide will happily recommend great trails for you to hike, depending on your desired difficulty level. One great spot is High Point Overlook; at nearly 5,000 feet (1,524 meters) in elevation, this lookout point offers amazing views of the southern part of the Las Vegas Valley with almost 70 miles (113 km) of visibility looking out toward Los Angeles. You'll spend approximately 3.5 hours driving and exploring on foot, and will cover at least 35 miles (56 km) round-trip from the start point in Summerlin. After your tour, you’ll be taken back to your Las Vegas hotel. Please note: price displayed is based per scooter; if traveling in a party of 2 please only select 1 traveler. If you wish to have individual scooters, select the number of scooters you will need. In order to operate the vehicles, customers must be able to speak and understand basic English for safety purposes.